My Scrappy Life: Blog Tour: It's A Winner! 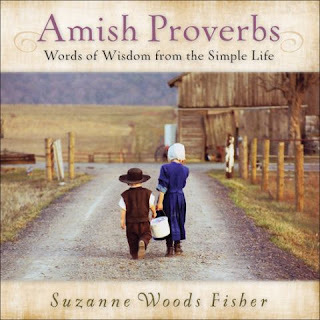 In my review of Suzanne Woods Fisher's newest book Amish Proverbs I challenged readers to submit their favorite family proverb, for a chance to win a copy of the book. My dad has a saying, which has become ingrained in my brain: "Morning comes awfully early." I have three rules for the children's ministry - 1) Love God, 2) Love One Another, 3) No Whining. I've also been known to look at a crying child (usually one of Denni's children - my "adopted nieces or nephew" and say, "Are you bleeding? Are you dying? Then you'll be ok"...yes, it sounds heartless, but trust me, it cuts down on the "crying vs tattletale" accounts. Congrats to barbjan10 for winning my extra copy of Amish Proverbs. Here's the list from Random.org! "My grandmother used to say "more things are wrought thru prayer than this world dreamed of," or something quite close. When one of the kids would say something cute and wise, it was always, "Out of the mouths of babes....."
"Work with what you've got." - Ms Cowboy--Dawnnell Holmes. Simple, but keeps us grounded. We find our projects are so much more fulfilling when we get creative and sustainable when we use what we already have instead of adding to the "stuff". So have you thought about what might be your proverb?